It seems that we have just about killed off manufacturing industries in Australia. The remaining local auto manufacturers - Holden, Ford and Toyota - will all be gone by the end of 2017. Jobs in the manufacturing sector will be as scarce as hens' teeth then, given that only 10% of current Aussie jobs are employed in manufacturing, down from 25% in the 1960s. The reasons are varied, and the significance of each individual factor will depend on your political viewpoint as much as anything else. Space here is too limited to discuss this subject at any length, but I did want to mention it with respect to today's topic which is shoes. 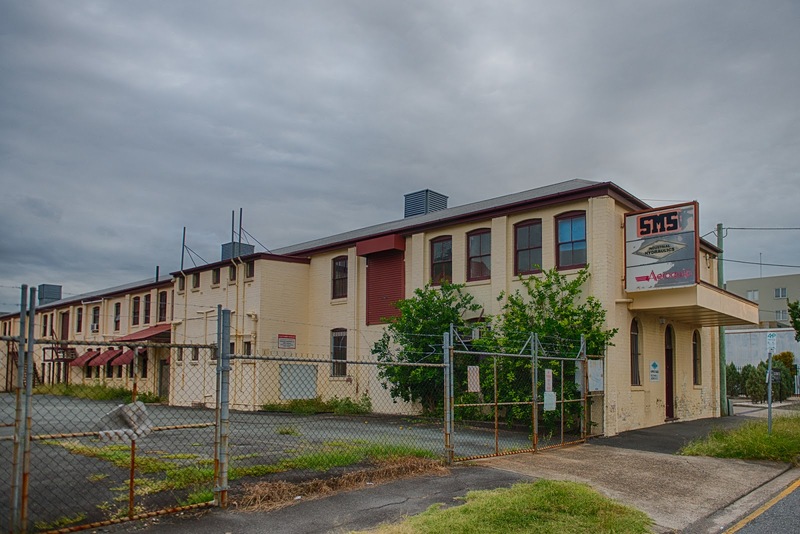 Pictured here is a purpose-built shoe and boot manufacturing factory in the suburb of Newstead. It started life in 1889 as the Goldsworthy & Perkins Boot Factory and was subsequently known as the Federal Boot Factory and the Australian Boot Factory. The building maintained its connection to the leather manufacturing industry until it was sold in 1981. It still stands and it is included in the Brisbane City Council heritage list, although apparently vacant at the moment. And this photo shows the working conditions in a similar Brisbane factory, Astill & Freeman at South Brisbane, in the year 1900. In 1900 there were about 1400 people employed by boot and shoe manufacturers in Brisbane. As well as Goldsworthy & Perkins, other notable firms were Hunter's, Dixon's and Lawrence's - they all had large premises and employed hundreds of staff. "... Messrs. Goldsworthy and Perkins, the well-known manufacturers at Newstead, Fortitude Valley, enjoy a high reputation, and deservedly so, their special lines of goods being fit for any showcase in the Australian colonies. 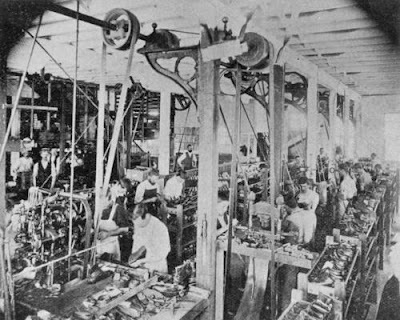 The machinery used by this firm comprise all the latest novelties of American Ingenuity, which turn out boots either machine-sewn or "fair stitched," the latter process showing a prettily-finished "stitch welt," equal in appearance to the best hand-made article, the difference in which no person short of an expert would be in a position to detect." The introduction of mechanisation was a boon for the factory owners but problematic for staff. In those days it was common for female workers to do the finishing jobs that were largely done by hand while the machinery was usually operated by men. The boot making industry employed large numbers of female workers and they were significantly disadvantaged by increasing mechanisation. Added to this mix, the government introduced a tariff on imported footware, thereby creating a larger market for locally made shoes and boots. The increased demand had to be met somehow, and factory owners started to move towards payment by piece - they thought that full-time employment and payment of an hourly or weekly wage did not provide sufficient incentive for workers to increase production. On the other hand, employees wanted security of employment in a factory rather than irregular off-site piece labour, and the impasse was the cause of strikes within the industry in 1899-1900. There seemed to be a few headwinds that delayed the recommencement of the blog this year, but I think we are back on track now. Happy & healthy 2016 to all. I am thankful that Goldsworthy & Perkins were well-regarded by the local population. That was not necessarily true for other factories. Workers wanted reliable employment, decent wages and safety in the work place. Bosses wanted compliant workers, no on-costs (eg paid sick leave), low wages and large profits. There is no way that these incompatible goals could live in harmony. As soon as Australian workers were guaranteed their rights in Parliament, the bosses started looking overseas where workers' rights were non-existent. Even now Seven Eleven underpaid and overworked their teenage workers, and threatened them with deportation if they complained. There has always been conflict between capital and labour. The pendulum swings back and forth, favouring first one, then the other. There certainly are scandalous things happening still - Seven Eleven, as you mentioned, and Queensland Nickel where workers' entitlements have allegedly been stolen. Now that the resources boom is over we really need to get back into manufacturing but it would have to be something special so that we can't get flooded with cheap imports. It really annoys me that we can't buy Australian ham at our local Woolworths anymore. If the manufacturing industry isn't providing jobs, we have to find other work for those who were or would have been employed in it. Easy to say, but a lot harder to do.